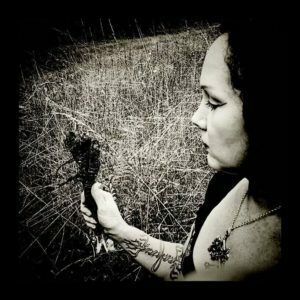 Catamara Rosarium is a Master Herbalist, Ritual Artist, and botanical alchemist. 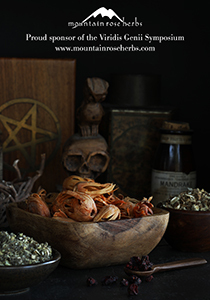 She is the sole proprietor of Rosarium Blends, a business dedicated to concocting various alchemical and talismanic creations to enliven the senses. 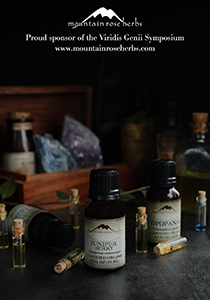 Her extensive herbal experience is motivated by a deep attraction to plants, scents, and how they impact the senses. 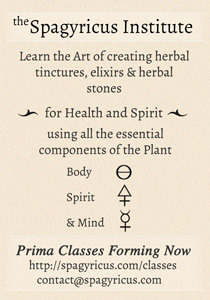 She has undertaken numerous unique trainings, apprenticeships and teachings in various esoteric herbalism currents which the culmination of has become the foundation and framework of her praxis and work. Catamara is co-founder, organizer and convenor of the Viridis Genii Symposium and co-organized the Esoteric Book Conference (Seattle, WA) for the first seven years after its inception. She has articles published in Sorita D’Este’s Hekate anthology, Her Sacred Fires(2010) , Verdant Gnosis Volume 1 (2015), Clavis, ‘The Green Key Edition”, published by Three Hands Press (2016). She co-edits the Verdant Gnosis series published by Revelore Press which is an ongoing printed publication anthology series which features articles by those who present at each years Viridis Genii Symposium. Her continuous passions lie in esoteric arts, with an emphasis on cross diversification, working to cultivate networking and community based events wherein diverse belief systems and traditional practices may be shared and to offer deeper understanding and education through these communal experiences. Click here to view the other Symposium Organizers.